CALLING ALL PEOPLE WHO LOVE MUSIC!! Did you know that singing is good for your health? It's a great way to keep in shape because you are exercising your lungs and heart. Not only that, your body produces 'feel good' hormones called endorphins, which rush around your body when you sing. 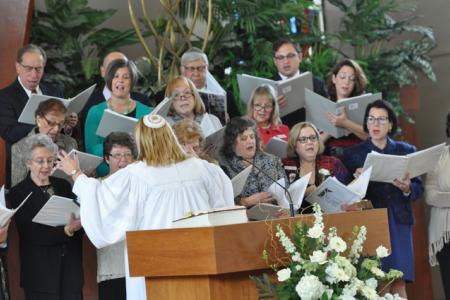 Our beautiful Volunteer Choir rehearses in the fall and enhances our magnificent High Holy Day services here at Beth Emeth. Additionally, they join the Jr. Choir in our festive Chanukah celebration. What a joy to be with likeminded musical Beth Emeth members and add to our worship in such a joyous and meaningful way. Contact Cantor Schechtman to join today!